The candle in the Orthodox Christian context is a symbol of a worshiper offering oneself to God. It is also a symbol that represents the Light of God or, more specifically, the Light of Christ. The candles may be made of traditional beeswax or cups of oil with floating wicks. Non-beeswax candles are frowned upon. Candles and the symbology of "light" are omnipresent in the Orthodox Christian's life, both in church and the home, providing an ambiance for prayer as well as decoration. In church, candles are presented a variety of settings. behind it. For the many processions from the altar a variety of processional candles are available, used by the deacons, members of the minor orders, and acolytes. During Pascha, the deacon's Paschal candle and the Paschal trikiron in the hands of the bishop or priest are ever present. are found before many icons throughout the nave and before icons on the iconostasis. Candle stands are placed in the narthex of some churches that are large enough to accommodate them. Frequently these stands will be a type of sand box to facilitate their use and upkeep. During baptism of new members into Christ's Church, the neophyte is given a burning candle to symbolize passing from "darkness to light". For the infant, it is the sponsor who carries the light. Many Orthodox faithful maintain icon corners in their homes that may accommodate a number of candles and/or vigil lamps. The daily and weekly rhythm of ones religious life focuses on the "light" as symbolized in the evening services of Vespers. This usage may have been carried over to the practice of Icon corners used during the prayers of the faithful at home. As one enters a church or before a shrine, the faithful often accompany their prayers with the lighting of a candle which even after one has departed represents that the prayers continue before God. 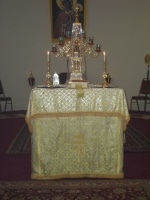 In the greatest of liturgical uses of candles is that during the Paschal services as the Paschal Candle and Paschal trikirion are lit upon the Resurrection of Our Lord and the light is passed through the church to the individual candles of the members of the congregation which are carried in procession out of the church symbolizing emerging from the tomb of Christ. This page was last edited on May 29, 2011, at 14:25. This page has been accessed 20,337 times.